Omaha will celebrate its 23rd Annual Earth Day Omaha on Saturday, April 20, 2013 at Elmwood Park located at 802 S. 60th Street. Earthday Omaha will feature ecological minded exhibitors, children’s activities, demonstrations, short speaker sessions, live music from local bands, and food from area vendors. Earth Day Omaha is designed to educate and inspire attendees to live green and healthy, and it’s FREE! For More Info, visit Earth Day Omaha. Omaha Organics is dedicated to the green movement. We realize that going green is not just a fad, it’s our future, which is why we choose to support Earth Day Omaha in its efforts to educate and inspire attendees to live green and healthy. Be a part of history; join us at this important event. Come visit us in our booth where you can meet Omaha Organics owner, Rob Elder and the founder of Safelawns, Paul Tukey, coined “the godfather of the natural lawn care movement” by the New York Times. Rob and Paul have extensive knowledge of lawn products and maintenance strategies for every property. Omaha Organics offers natural nutrient products that are safe for you, your kids, pets, and the environment. Paul will also be speaking on the “Demonstration Stage” from 1:05-1:20. Following the Earth Day event at Elmwood Park, Omaha Organics will be joining Benson Community Gardens with our guest Paul Tukey for a fun evening of live music, beer tasting and garden and lawn discussions. OMAHA, Neb. — The SafeLawns movement will be featured in Nebraska for the first time when founder Paul Tukey appears at the Earth Day Omaha 2013 event slated for April 20 at Elmwood Park. 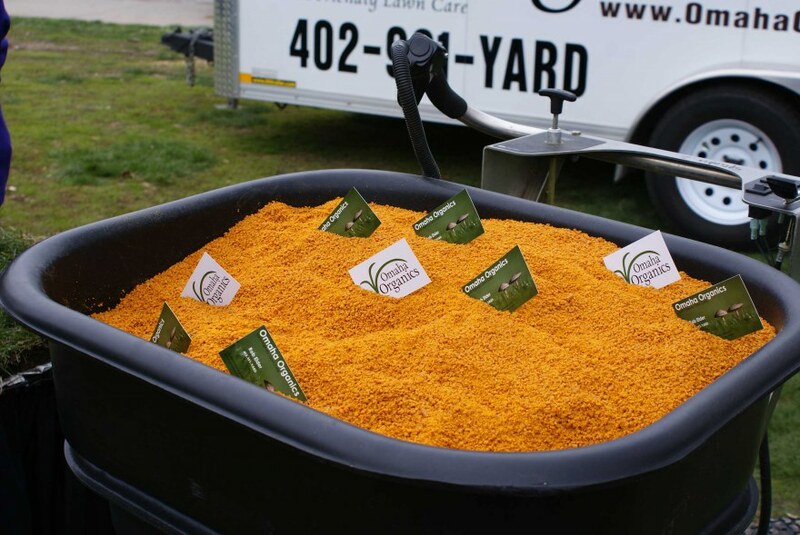 A division of Ground Solutions, Omaha Organics is the brainchild of Rob Elder, a lifelong lawn care professional who began filling the demand for more natural approaches for turf maintenance in 2008. In 2010 he also developed his own line of organic fertility products, utilizing many of the same materials local farmers use to feed animals. The simplicity of organics is a point Tukey and Elder will reinforce during question-and-answer sessions at the Omaha Organics booth at the Earth Day event. This year marks the seventh consecutive spring Tukey has toured North America in an effort to reduce reliance on synthetic chemical fertilizers, weed killers and insecticides. Founded by U.S. Senator Gaylord Nelson, the first Earth Day was celebrated on April 22, 1970, marking the birth of the modern environmental movement. Senator Nelson recruited a national staff to promote Earth Day events across the United States. Senator Nelson seized an opportunity to channel the energy of the anti-war protest movement, and capitalize on the emerging consciousness towards environmental concerns to force environmental protection into the national political agenda. Twenty million Americans across the country participated in the first Earth Day, demonstrating for a healthy, sustainable environment in massive coast-to-coast events. The events were unique in that they brought together Republicans and Democrats, wealthy and poor, city and farm, business owners and laborers in a common cause. Earth Day led to creation of the United States Environmental Protection Agency, and the passage of the Clean Air Act, Clean Water Act, and the Endangered Species Act. In 1990, Earth Day went global, rallying 200 million people in 141 countries putting environmental issues into the spotlight for the world. Earth Day efforts in the 90’s focused on boosting recycling efforts worldwide, and also led the way for the 1992 United Nations Earth Summit in Rio de Janeiro. In the 2000’s, the focus of Earth Day events shifted to global warming and a push for clean energy. Now over 5,000 environmental groups organized in 184 participated in Earth Day events. Earth Day celebrated its 40th anniversary in 2010. Please join us in participating in Earth Day 2013, and continue the long tradition of rallying for a healthy earth for generations to come! class="post-template-default single single-post postid-98 single-format-standard samba_theme samba_left_nav samba_left_align samba_responsive wpb-js-composer js-comp-ver-5.0 vc_responsive"